Protesters at the November 6 rally in Khorugh also demanded that the authorities remove police checkpoints in the city. AKIPRESS.COM - At least 100 people in Tajikistan's restive Gorno-Badakhshan region have rallied in the provincial capital, demanding an investigation into an incident in which a police officer shot and wounded three local men, RFE/RL reports. 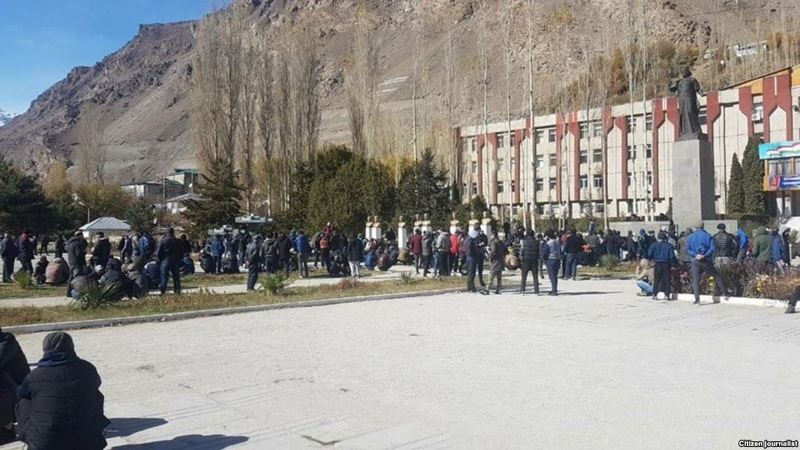 Protesters at the November 6 rally in Khorog, mainly young people, also demanded that the authorities remove police checkpoints that were set up in the city in September. A police officer fired a pistol at a group of people in Khorog's Tirchit neighborhood late on November 4, wounding three men. Regional governor Yodgor Faizov met with the protesters at the rally on November 6 and promised that a special commission would thoroughly investigate the incident. Meanwhile, a state agency created two months ago to oversee security in the region offered an explanation that appeared aimed at deflecting blame from the police. In a statement, the Inter-Ministerial Staff for Security in the Gorno-Badakhshan Autonomous Region said that the shooting on November 4 occurred after five young men attacked a traffic-police car. The regional governor’s spokesman, Golib Niyatbekov, told RFE/RL earlier that the officer had to use his pistol after a group of young men fought with police while demanding the removal of police checkpoints. According to Niyatbekov, police detained two men during the confrontation. Local residents, however, deny that they demanded the removal of checkpoints and contend that police attacked them for no reason. Additional police checkpoints were erected in Khorugh in September after President Emomali Rahmon publicly reprimanded local authorities, saying they had failed to prevent drug-smuggling and other illegal activities by local criminal groups. The Gorno-Badakhshan region, which takes up most of the eastern half of Tajikistan and borders Afghanistan, has been restive for years. At least 70 people are believed to have been killed in a Tajik military operation against local armed groups in 2012. In 2014, clashes between local residents and police in Khorog left at least three people, including a police officer, dead and at least seven people, including three police officers, injured. Unlike the majority of Tajikistan's population, which is mainly Sunni Muslim, many of the residents of Gorno-Badakhshan are Ismaili Shi'ite Muslims.